Check out pics from Andre Ethier's retirement celebration on Friday from Cat Loves the Dodgers. She also shares pics from Sunday's game; which was her birthday weekend and includes her experience on the field before the game, here. Per Ken Gurnick at MLB.com; "Kershaw named to Hooton Foundation board: Organization educates youth on dangers of anabolic steroids." Jim Callis at MLB.com ranks the 10-best farm systems, here. The Dodgers are ranked as the eighth best. This mornings Baseball America prospect report made note of Dodger outfielder DJ Peters. Peters combination of speed, power and strikeouts has stayed largely true to form this year with his promotion to Double-A. Yesterday he went 4-for-5 with a double (his 19th), a home run (his 22nd) and a strikeout (his 153rd). 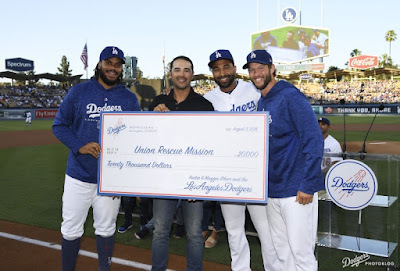 Via Michelle R. Martinelli at For the Win; "Dodgers' Kenley Jansen had a great short joke after Kevin Hart's first pitch." Per Derek Wetmore at 1500ESPN Twin Cities; "Molitor got to watch Brian Dozier’s first home run with the Dodgers, ‘I’m happy for him’"
Via Ken Gurnick at MLB.com; "Dodgers, Nomar introduce new youth academy." In Los Angeles, the Garciaparra Family's GBG Training Academy in Redondo Beach, Calif., will be the first Dodgers Training Academy, serving all skill levels with accommodations for players and families unable to afford the high price of other academies. "E|L1 is a player-first organization that values personal development just as much as training and winning, and believes that youth of all ages and skill levels should have greater access to the game," said Garciaparra, the current Dodgers broadcaster who founded GBG with his brother, Michael, and partners, Paul Rappoli and Trolia to develop youth and high school players. Via Rich Mueller at Sports Collectors Daily; "Topps: Card Business Not For Sale." Over the weekend news spread quickly, via Ken Rosenthal at The Athletic (subq. req. ), that Angels manager and former Dodger legend Mike Scioscia would retire at the end of the season. Since the report, though, Scioscia has denied it. Either way, I'd like to extend a hearty congrats to one of my favorite all-time players. Congrats, Mike! Another @Dodgers prospect with a player of the month award!